Clogau is a company that prides itself on creating jewellery that is not only beautiful, but also expertly hand-finished to a high quality using ethically mined gold and conflict-free diamonds. On this page we tell you where we mine our Welsh gold, our 7-stage quality control process, and the painstaking efforts and craftsmanship that are involved in every piece of Clogau jewellery. We are also members of many highly esteemed associations that require strict procedures of ethical practice and quality control. Where does your Welsh gold come from? The Welsh gold that goes into every piece of Clogau jewellery comes from a stockpile that was mined by ourselves during the late 1990s. Why do you only include a small amount of Welsh gold? Gold mining no longer takes place in Wales, making Welsh gold one of the rarest golds in the world. For this reason, we can only include a small amount of this exclusive gold in each piece. This allows our jewellery to be not only unique but also affordable to those who wish to own a piece of Welsh and Royal history of their own. It also ensures the longevity of our supplies. How much is Welsh gold worth? 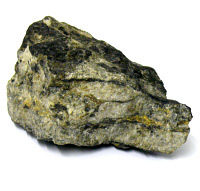 At present, Welsh gold can be valued up to 30 times more than standard world gold. The smallest nugget weighed 3g (0.1oz) had a guide price of £600-£700 but went for £4,000. The 16.26g (0.5oz) of gold flakes and dust was expected to fetch between £1,600 and £2,000 but went for £10,500. The precious metal was mined from Clogau St David's after a farmer in the area, Jack Williams, approached Kerry John Thackwell and his father Ray. The pair came to Wales to mine in Gwynfynydd after working in Western Australia. Mr Williams told them he was the last miner to work in St David's in 1939 and could show the men where there were gold-bearing veins. How much Welsh gold is in each piece? We do not state the % content for a number of reasons. Firstly, the precise Welsh gold content varies with the caratage of the gold in the piece. Also, we do not wish to be obliged to a fixed % in case we are forced to reduce it in the future due to depleting stocks. You can be guaranteed that there is Welsh gold within your jewellery which is shown by the Welsh Dragon stamp which is applied. Where do you include the Welsh gold in your jewellery? The Welsh gold is normally included within the rose gold detailing of the piece (and is not the entire rose gold part, as sometimes assumed). In the items that do not contain rose gold, we incorporate it within the other gold featured in the piece. Every piece of Clogau jewellery is marked with the Welsh Dragon stamp to indicate that a touch of Welsh gold is contained within. The Clogau stamp identifies the item as a genuine piece of Clogau jewellery. Statement from our trusted partners Arran Aromatics Limited, in association with Clogau for our Compose by Clogau® scent. Arran Aromatics Limited share the public’s concern that animals should not be used to test cosmetics and toiletries products. It is Arran Aromatics Limited’s policy to ensure that animal are not used to develop and test out products. None of our finished products have ever been tested on animals, nor have we ever commissioned out suppliers or any other company to carry out animal testing on our behalf. We produce all collections in-house on Arran, so have the flexibility to tailor products to meet our client’s individual requirements. Our jewellery is consistently hand-finished to a very high standard using conflict-free diamonds, ethically mined gold and a 7-stage quality control process. Originally, all Clogau jewellery was manufactured in North Wales, but in 2005 the decision was made to move production overseas in an attempt to fulfil customer demands for shorter manufacturing and delivery times, and to sustain the growth of the brand. 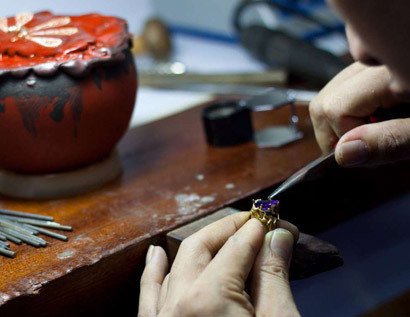 The change has meant that the costs to both customer and company have been reduced, and customers now receive their jewellery with 2-3 working days, instead of several weeks. It has also meant that we can keep up with the demand for Clogau jewellery on the high street and, increasingly, internationally. The majority of Clogau jewellery is made up of multiple components due to the addition of Welsh gold (usually in the rose gold detailing), thus complicating the manufacturing process. 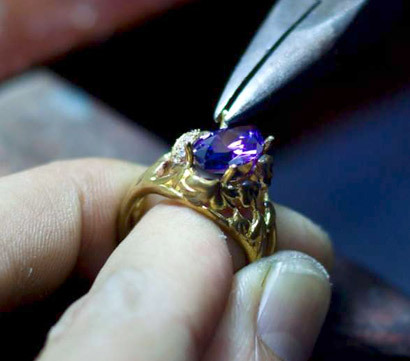 A team of dedicated employees are responsible for creating jewellery of the utmost beauty and quality. Clogau classically uses either of two cuts: the classic brilliant cut which has been perfected to generate the maximum radiance possible and the most important cut of the modern era, the square princess cut. Gold from the Clogau St David’s Mine, and other Welsh gold, has been mined in an ethically sound manner. Within the majority of our jewellery, however, Welsh gold is combined with World gold. As members of the Responsible Jewellery Council, we are committed to completing the compulsory member certification against the Code of Practices and the voluntary Chain of Custody standard, which is currently under development. The RJC aims to improve the transparency of the full jewellery supply chain; from mine to retail. The quality of construction, finish and methods used are under constant review and improvement, and are written into the Service Level Agreement for suppliers. The agreement covers manufacturing requirements such as high quality alloys to be used in the anti-tarnish casting grain, German findings/clasps and chain sourced from the UK. Clogau is continuously striving to improve the logistical operations it undertakes. Recent developments have enabled international jewellery orders to travel on average 80% less distance to their destination, compared with the original journey. Clogau operates a zero-tolerance diamond policy and insists on written assurance from each diamond supplier that the diamonds supplied have been sourced from conflict-free countries and conforms to the terms of the Kimberley Process Certification Scheme. Set up by governments, the international diamond industry and civil society organisations, the KPCS aims to stop the trade in ‘conflict diamonds’ and ensure that diamond purchases do not fund violence. Clogau warrants that with regards to any product fabricated from rough diamonds mined from 01.01.2003 onwards, that the diamonds have been purchased from legitimate sources not involved in funding conflict and are in compliance with United Nations Resolutions. We guarantee that these diamonds are conflict free, based on personal knowledge and/or written guarantees provided by the supplier of our diamonds. For any product fabricated from rough diamonds mined prior to 01.01.2003, we warrant that conflict diamonds will not be knowingly sold and that, to the best of our ability, we will undertake reasonable measures to help prevent the sale of conflict diamonds in this country. Clogau declares that all carat gold items we supply, and will continue to supply, conform to the ‘Dangerous Substances and Preparations (Nickel) (Safety) Regulations 2005'. Clogau is a member of the Responsible Jewellery Council, an international, not-for-profit organisation established to reinforce consumer confidence in the jewellery industry. 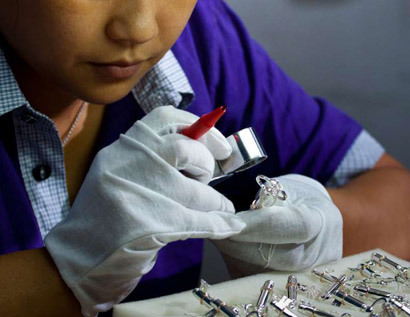 In association with the RJC, we are continuously defining and implementing responsible jewellery practices throughout our diamond and gold jewellery supply chain in order to further establish the RJC’s vision of a ‘community of confidence. Since 1894, The National Association of Goldsmiths was established to serve and support the Jewellery Industry of Great Britain and Ireland. The Association promotes high professional standards among its membership to inspire consumer confidence and to enhance the reputation of its members. The Association is committed to education and information in legal, technical, and human resource areas. Members must be committed to an honest and knowledgeable approach to their business and adhere to the Code of Practice. For nearly 125 years, the British Jewellers' Association has promoted and protected the growth and prosperity of UK jewellery suppliers through a wide range of business support services. The Jewellery Distributors' Association is a non-profit-making trade body specialising in supporting the activities of those who wholesale, distribute, import and export precious and fashion jewellery. The JDA assist and advise Clogau on various aspects of business such as legislation. As a supplier of prestige products to the Duty Free and Travel Retail industry, Clogau benefits from a specialist recruitment service, industry research reports and news offered by the Tax Free World Association. The Institute of Direct Marketing is internationally recognised as the leading professional body for the development of direct, data and digital marketing. An educational trust and registered charity, the IDM aids Clogau employees with lifelong learning and encourages business performance. The Institute of Directors provides Clogau and its employees with business information, support and advice in order to raise standards at management level. Ellis Whittam provides business support services to UK employees with the main principal of exceptional quality. Services include HR & employment law, health & safety, training and recruitment. The Wales Quality Centre is a not-for-profit, membership organisation helping organisations across all sectors of the Welsh economy to develop, improve and grow their business through training and advisory services. With the help of WQC, Clogau has been able to drive key business areas such as sustainability, creativity and new product development via a renewed focus on the need to promote innovation and business excellence. Clogau has a long-standing relationship with local charity, Hope House Children’s Hospices (Ty Gobaith, in Conwy) who provide respite, terminal care and support to life-limited children, young people and their families. The hospices rely almost completely on charitable donations to support their £4m a year service cost. Clogau regularly fundraises for Hope House through annual fun runs, gala evenings and dedicated jewellery collections. We look forward to continuing our support towards this imperative charity, which is particularly close to our hearts.